Please join us Wednesday, April 17 as we continue our 2019 programming Big Shoulders, Big Ideas with a panel of industry experts sharing their perspective on the redevelopment of the Old Post Office and what factors led to the redevelopment’s success when so many previous attempts failed. Registration ends April 11. This is a terrific opportunity to BRING A GUEST so they can make connections and discover the great value of LAI Ely Chapter membership. **Remember, the chapter now requires prospective members to attend two events at minimum to be eligible for induction. (Moderator) Eleanor Esser Gorski, AIA, is Bureau Chief of the Bureau of Planning, Historic Preservation and Sustainability at the City of Chicago, Department of Planning and Development. This bureau coordinates the City’s multi-disciplinary planning and design efforts across departments. Ms. Gorski has managed city review and financial assistance for hundreds of residential and commercial projects for the City, notably adaptive reuse of architecturally significant loop office buildings. She also oversees equity-based city planning to increase economic development and the integration of sustainable practice into each project. A licensed architect, Ms. Gorski received degrees from the University of Illinois, Urbana-Champaign and the Pennsylvania State University. She is a Fellow both of the American Academy in Rome as well as the University of Chicago Civic Leadership Academy. Mariah DiGrino is a partner at DLA Piper. She concentrates her practice in the areas of land use and zoning, public-private financing, public incentives, historic preservation, and community and economic development, as well as general real estate. Mariah’s practice involves representation of owners, developers, retailers, investors and public-private partnerships on both the local and national levels. She has experience securing annexation, development, zoning and subdivision approvals, negotiating and implementing public-private development and financing arrangements and public incentives, negotiating historic preservation designations and incentives, performing general and zoning due diligence and property evaluation, and negotiating and closing real estate acquisitions and dispositions. John Latoza is Vice President of the Project and Development Services team with JLL. He brings more than 20 years of experience managing major hospitality projects, ground-up developments and new construction. 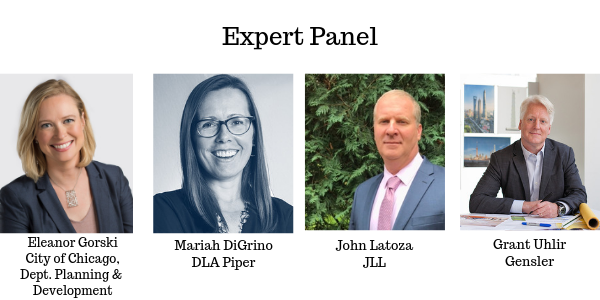 Prior to JLL, John was the Director of Development for the Metropolitan Pier and Exposition Authority (MPEA). Grant C. Uhlir, FAIA, LEED® AP BD+C, is a Co-Regional Managing Principal of Gensler’s North Central region. He brings a strategic design focus coupled with proven senior leadership, client relationship and project management acumen, and industry-leading expertise in highly complex projects. Grant previously served as a leader of the firm’s Critical Facilities practice and has more than three decades of design experience in corporate headquarters, mixed-use developments, and adaptive reuse and repositioning projects across the globe — including the world-renowned Shanghai Tower, for which he served as project director. He is currently leading the 2.8 million-square-foot redevelopment of Chicago’s Post Office. Grant is a Trustee and past president of the AIA Chicago Foundation Board and is also a past president of AIA Chicago. He is a member of the Economic Club of Chicago, the Council on Tall Buildings and Urban Habitat, and a Product Council Member with ULI Chicago. Grant received his Bachelor of Architecture from Iowa State University and studied architecture and urban studies at the University of Bath, England.